Such compromises may involve tweaking the original requirements of (a) ground spatial resolution, (b) channel selection and (c) acceptable signal-to-noise in order to optimise data acqusition, especially when the parameters conflict between requested sensors. The following discussion will hopefully help the user in defining the requirements of an airborne mission and assist in completing the NERC ARF proposal form for future use of the Facility. The AISA Eagle (and to a lesser extent the AISA Hawk) have an option to ‘bin’ spectral and / or spatial data. This capability allows data to be collected in conditions where the levels of illumination are less than perfect. UK conditions typically require a 2x spectral binning level. Nevertheless, discussions between the NERC ARF team and the research team should identify the basic spectral and spatial requirements of the project’s science. In some cases where both a fine spectral and a fine spatial resolution are required, suitable conditions may not be present in the same year as that in which the application was made. Spatial resolution is primarily determined by the height above the ground level of the aircraft (altitude – datum). For a detailed spreadsheet of the variations of pixel resolution, swath width etc. with flying height for the Eagle, Hawk and comparison instruments, please download our two-paged ‘ready reckoner’. Please note that at low flying heights pixels will not be square but instead will be elongated in the flight direction. Flightline swath width is a function of the altitude flown by the aircraft, increasing as the altitude increases. Flightline length, in terms of the number of scan lines, is also a function of altitude since at low altitude the pixel lengths of the ATM and casi are smaller and there are therefore, more lines needed to cover a given ground distance. Ideally, study areas and flightlines are drawn up by the user on appropriate map bases, at least 1:50,000 scale or better, and included with the completed application. The directions to be flown for single or multiple flightlines should be chosen with care. It would be normal for flightlines to run directly over and parallel with elongated ground targets, reducing the requirement to a single flightline. However, it should be borne in mind that most airborne remotely sensed data, acquired in the optical domain suffer, to some degree, from atmospheric distortions. These can manifest themselves as a brightening towards the edges of the image (limb-brightening), due to increases in atmospheric scattering, caused by changes in the sun-target-sensor angle and to increases in path length. The asymmetry and amount of atmospheric distortion is a function of the azimuth of the flightline, in relation to the azimuth of the sun and its elevation. Flying perpendicular to the solar azimuth creates the maximum amount and maximum asymmetry of the distortion, while flying directly towards or away from the sun, reduces these effects to a minimum. If the reduction of atmospheric distortions is critical to the particular airborne mission / user application, the mission should be flown to cover the total area of the ground target with parallel flightlines flown in or out of the sun. This can be important for terrestrial targets, but essential for aquatic targets to avoid the effects of the strong specular reflection or ‘sun-glint’ from the water surface. Multiple parallel flightlines should be flown with a 20-30% overlap to ensure complete coverage of the target and to avoid missing any section due to changes in aircraft attitude or drift as it flies over the ground. Generally, multiple overlapping flightlines should be flown in one direction only so that aircraft speed in relation to head wind or side drift (crab-angle) are kept similar for each flightline. Flying alternate directions can cause major changes in alongtrack pixel resolution between flightlines, due to the possible change in over the ground speed, flying with or against any head or tail winds. Timing of the flightline(s) also needs to be considered carefully. Following the above criteria of flying towards or away from the sun requires a knowledge of the solar azimuth which varies with time of day. For example, a morning flight might be in a NW-SE direction, near midday in a N-S direction and in the afternoon from NE-SW, all flown towards the sun. In practice the pilot/navigator may prefer to fly away from the sun’s direction, having established its azimuth from the target, to avoid glare, improve visibility and flight safety, but this may be precluded by prevailing wind direction. The timing criteria also concerns the solar elevation. Early morning or late afternoon flights will encounter a low sun angle, causing long shadows and enhancement of topographic features at the expense of lower light levels. Some applications may require these conditions, but in general, most flights are carried out between +/- 2hrs of solar noon, giving high sun angles, reducing shadow effects, minimising atmospheric scattering distortions and providing maximum light levels for data acquisition. 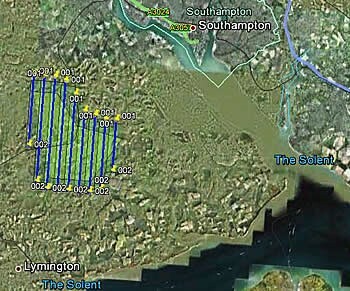 Timing of flights may also be controlled by the nature of the target such as with inter-tidal zones, where low tide for a particular area will vary and tides tables reviewed in advance of a proposal submission. Seasonal variations of solar azimuth and elevation can constrain some missions due to the length of daylight hours over the year. Timing may also be critical for particular applications where multi-date flightlines are required to monitor changes in growth status of crops or in relation to spring or neap tides. If the application requires flights on days where Earth observation satellites are covering the same area, knowledge of their repeat cycles are important. Base maps included with the application should contain, if possible, the likely flightline dimensions (swath width and length), derived from a knowledge of the user required altitude/spatial resolution and flight orientation or at least a clearly marked maximum area of interest and any critical zones that MUST be covered. It should be borne in mind, particularly by new users, of the large data volumes that airborne remote sensing can generate. Requests for very high spatial resolution data over large areas of terrain or high temporal resolution repeat missions will require a large number of flightlines which will take a substantial amount of time to acquire and process. Users, both new and experienced, are requested to apply for the minimum necessary to fully meet their science objectives as this not only assists the most efficient use of the facility, but also reduces wasted data analysis by the user. Excessive requests may be reduced by the NERC ARF Steering Committee during the review process and a revised set of flights offered to the user. New users, unfamiliar with the capabilities of the facility’s sensors, or users developing a new application of the airborne remotely sensed data may be advised to reduce the overall spatial coverage of their proposal to acquire a reconnaissance data set on which to test the application. This may, however, result in an increased number of smaller flightlines, using various sensor modes or at additional spatial resolutions to provide a comprehensive dataset, on which to determine the optimum mission / sensor parameters for future applications for use of the facility. In planning a mission to meet the users requirements, both pilot and NERC ARF science/operations coordinator must ensure that they meet with Civil Aviation Authority (CAA) and current Air Traffic Control (ATC) restrictions applying over the target area. The airways within and around the UK are the busiest in the world with civilian and military air traffic, both of which may have controlled air space/airways or restricted danger areas. There may be total exclusion zones near military bases and firing ranges or restricted flight levels above or below commercial air lanes. The pilot has to file a flight plan and get the necessary flight permissions in advance of each mission. NERC has a very good rapport with the National Air Traffic Service and can generally get entry into the airways with the minimum of fuss. Some areas may require contact with local ATCs on the day of, or even at the beginning of a flight run, and last minute withdrawal of permission may cause a flightline or mission to be aborted. Air safety will always be of paramount importance in any NERC airborne activities. Flight restrictions apart, airborne campaigns are organised to maximise the collection of good airborne data for the user, based on the vast operational experience of the flight crew – pilot, operations coordinator and sensor operator. The users should provide as much information as possible on the scientific requirements and restrictions of their proposal and leave the operational implementation to the flight crew to meet these in the most efficient and practicable way. It is estimated that there are only about 40 totally clear sky days in the UK per year with the rest affected by some fraction of cumulus or high level cloud. The proportion of cloud acceptable during any particular mission is highly dependent on the user application with some experiments, for example, developing atmospheric corrections algorithms or calibrating airborne or satellite sensors, requiring near perfect conditions, while other surveys, not as dependent on the irradiance distribution, producing excellent results with 20-25% cloud cover in the area. The critical aspect in most missions is to ensure that, although there are clouds around, they do not directly obscure or indirectly shadow the target during data acquisition. Since homogeneity of the solar irradiance is often more important than absolute level, in deriving consistent surface reflectance, a small proportion of surveys could even be carried out under completely overcast (uniform) cloud cover. Even in what seems pretty clear skies (no cumulus) the presence of high level cirrus clouds can have an affect on the absolute level of irradiance at the target and consequently the signal level at the aircraft. Horizontal visibility is only loosely connected with vertical visibility and some missions may be impossible due to extremely high haze conditions between the aircraft and the ground. It should be borne in mind that most of the atmospheric constituents impairing optical remote sensing are concentrated in the bottom few kilometers of the atmosphere and that at 10,000ft the aircraft is viewing through about 90% of the atmosphere’s optical thickness. Weather conditions can vary dramatically and rapidly, and timing of flights should be considered in the light of local or seasonal history on the build of late morning cumulus or dissipation of early morning mist/fog. The weather in the days preceding a mission may also be relevant in the requirement for a lengthy period of dry weather or conversely fresh precipitation prior to a flight when applications involve soil or vegetation moisture, or low/high sediment runoff into streams and estuaries. A longer period of fine weather maybe also be required than just for the day of the flights, if ground based sampling (ie. vegetation sample collection) takes several additional days requiring near constant conditions. Having been notified of a successful proposal for use of the ARS Facility the Principal Investigator will be contacted by the NERC ARF Co-ordinator to discuss and confirm the user requirements for flights and sensor setup. If simultaneous fieldwork is planned the NERC ARF coordinator will arrange with the user for a means of communication leading up to and on the day of the flight to confirm the go ahead for the mission and if possible to obtain an up to date local weather forecast from the team on the ground. The NERC ARF co-ordinator has the overall responsibility of fitting in all the required campaign missions in the most efficient way and this often involves decisions, mainly based on local weather conditions, to fly in one part of the country or another where conditions may be better. Unless restricted to a specific date and time for flights when, for example, they are simultaneous with a satellite overpass, the fieldwork team should make themselves available for several days either side of the intended flight day to improve the overall chances of a successful flight. It is possible to set up a communications link with the NERC ARF co-ordinator via mobile phone or VHF radio to use on the day of flights. Some projects, involving co-ordinated field work measurements, may need to be informed by radio that a flightline is about to be flown so that simultaneous measurements can be made. Even without these communication aids, it is often possible to see the NERC aircraft, particularly at altitudes below 5,000ft, or hear the engines when at its maximum operational altitude (20,000ft). Many users of airborne remotely sensed data who are developing applications, or testing algorithms to derive biophysical parameters, carry out fieldwork to collect a wide variety of validation data via in-situ measurements or by sample collection for later analysis. This section relates only to the ground and auxiliary measurements that can be carried out during, or as close in time as possible to, the over flights to enhance the use and interpretation of the remotely sensed data. These measurements are mainly restricted to the acquisition of solar irradiance, radiance or surface reflectance from bright and dark targets that will be contained within the imagery, using the type of multi-band radiometers or spectroradiometers that can be obtained on loan from the NERC Field Spectroscopy Facility. These data can be used in empirical corrections of the airborne data to remove or minimise the effects of atmospheric distortions or to check parametric atmospheric corrections using radiative transfer codes. More sophisticated instruments can be used to retrieve a measure of various atmospheric optical properties for direct input to radiative transfer codes, but these are not generally available to the user community. Simple measures of surface barometric pressure, temperature and humidity are also extremely useful when applying corrections to airborne remotely sensed data. A completely different set of measurements may also be made before, during or after the flights to determine the exact location of Ground Control Points (GCPs). These are best made with a Global Positioning Satellite (GPS) system used in differential mode to obtain precise location co-ordinates of features that can be easily located in the imagery. GPS-based ground control points may be used where very high precision geometric rectification is required by elimination of residual translational errors resulting from use of the in-flight navigational data (level 3b products). GCPs derived from map co-ordinates alone may not be sufficiently accurate for use due to errors in the original base map triangulation or in the transformations needed between the Ordnance Survey (OSGB36) co-ordinate system and the World Geodetic System (WGS84) used by the constellation of Global Positioning Satellites.